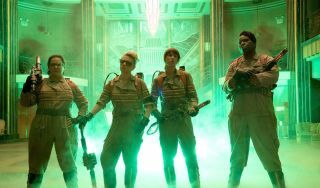 The first trailer for Ghostbusters didn't exactly go down well, with Melissa McCarthy herself noting that it left her a little confused. I don't think that applies to the trailer which Sony Pictures have unveiled today; packed with plenty of new footage, it reveals a little more of the plot and action in Paul Feig's reboot. This trailer is a vast improvement over the first promo; the jokes are funnier, the effects look impressive, and it's clear that the cast have a lot of chemistry. While I am worried that it reveals a little too much - it looks like the main ghost will take control of Chris Hemsworth in the final act - I'm fully on board for this movie.